2. Skip the Myntra Promos and it will as you to Register or Login now. 3. Click on Register under Use email address with “ I have Registration code” as checked. 5. Verify your Mobile Number by OTP and that’s it , you will get Rs.300 Myntra points to your Myntra Account. 1. Now , you have got Rs.300 free Myntra voucher points in your accountwhich you can use for your shopping. 2. With this Rs.300 we can shop many things from Myntra like Socks, Inner wears , Hand kerchiefs & More for free. 3. Search for T – Shirts at myntra Which ranges from Rs 250 which you can buy for free. 4. Search for Shorts which costs under 200 which you can shop it fro free . 6. Search for Casual Shoes , which you can shop it for Free . 7. Like wise there are many products you can buy it for free or for Min. rupees. 8. You can also shop your favorite product and you can pay Rs.300 through Myntra Account and rest by your payment. 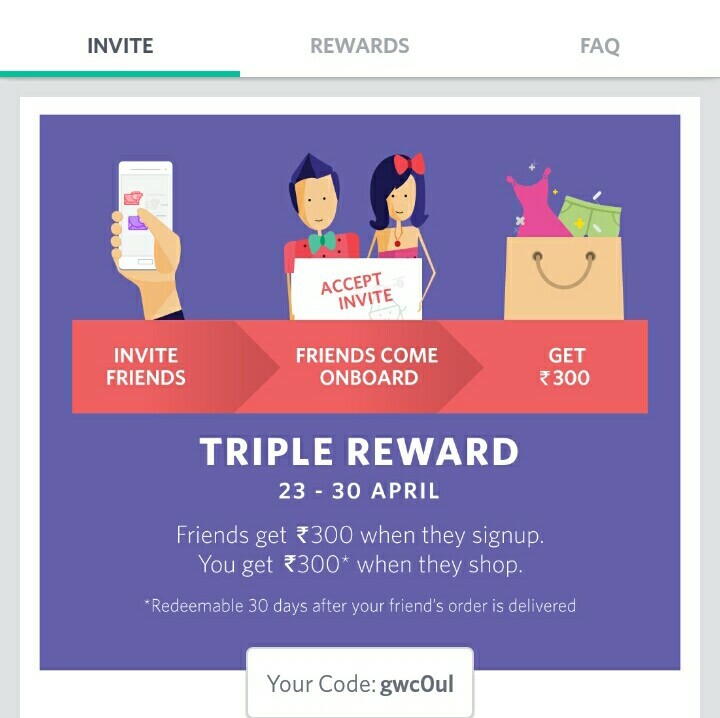 Share The app And get 300 per refer Earn upto 4000.